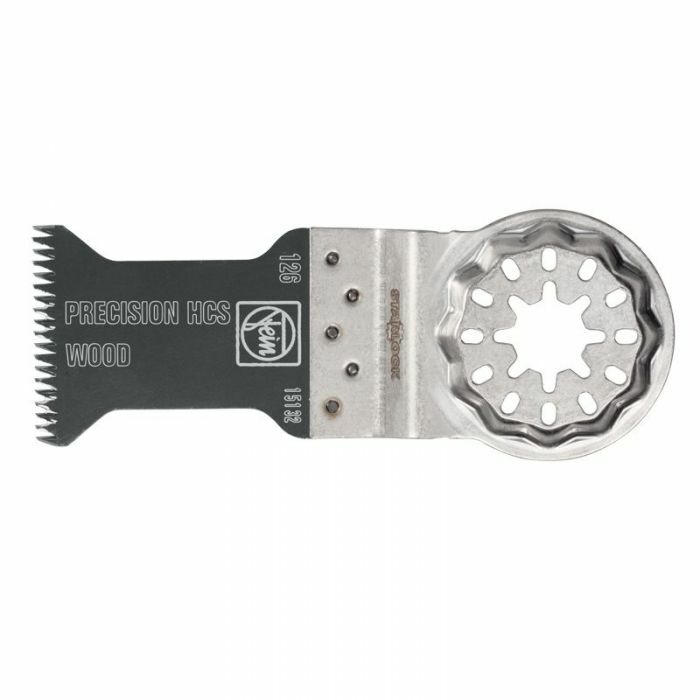 This 1-3/8" wide precision carbon steel blade has an aggressive double row tooth design for fast cutting on wood, laminate, drywall and plastics up to 1-5/8" thick. Sold in a pack of 3. These high carbon steel blades have an aggressive double row Japanese (coarse) tooth design for faster cutting in wood, laminate flooring, drywall and plastic up to 1-5/8" thick. Blades have an offset mounting flange for flush cutting and can cut all the way into corners. The Starlock mount offers fast, secure, tool-less blade changes - in under 3 seconds - and 100% power transfer due to the stainless steel 3D tool mount. Blades are extremely rigid for precise cutting results. Starlock Blades will fit the Fein MultiTalent, MultiMaster, SuperCut, Bosch, Makita, Rigid, Milwaukee, and others.